We were conceived in the heart of God, and for this reason each of us is the result of a thought of God. Each of us is willed, each of us is loved, each of us is necessary. To soften hearts, change minds and advance the sanctity of human life. Catholics4LIFE has been organized specifically for Catholics in the Archdiocese of Milwaukee to draw together support to promote LIFE. The organization will work to coordinate activities at the parish level throughout the Archdiocese through their respective Respect Life Committees. These parish committees need a resource of collaboration, information, and support. Currently, there are 211 parishes in the Archdiocese. Their coordinated efforts on LIFE issues can be harnessed to affirm LIFE changing our societies’ mindset on abortion, capital punishment, embryonic stem cell research, human cloning, and euthanasia. 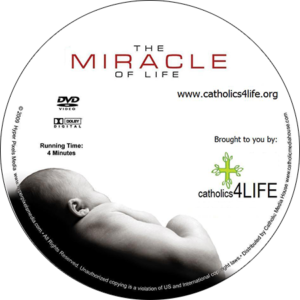 Catholics4LIFE will work in partnership with the Archdiocese of Milwaukee and in conjunction with the positions stated by the U.S. Catholic Bishops. Today I believe the Lord is saying to us all: do not hesitate, do not be afraid to engage the good fight of the faith (cf. I Tim 6:12). When we preach the liberating message of Jesus Christ we are offering the words of life to the world. Our prophetic witness is an urgent and essential service not just to the Catholic community but to the whole human family. All powerful God, you are present in the whole universe and in the smallest of creatures. You embrace with your tenderness all that exists. Pour out upon us the power of your love, that we may protect life and beauty. Fill us with peace that we may live as brothers and sisters, harming no one…. Get your DVD by visiting our sign up page.